(Nanowerk News) Plant, fungal and bacterial species all rely on cellular sensory processes known as ‘two component systems’ (TCS) to monitor external conditions and deliver instructions on how to respond to fluctuations. “TCS can sense and respond to a variety of environmental changes related to osmotic pressure, oxygen, amino acids, metal ions, nutrients, light, hormones, and so on,” explains Yoshitsugu Shiro of the RIKEN SPring-8 Center in Harima. Each TCS is composed of two proteins: a histidine kinase (HK), which is the outward-facing receptor, and a response regulator (RR), which transmits HK signals within the cell. Following activation by an external stimulus, HK picks up a phosphate group from an adenosine triphosphate (ATP) molecule, which it subsequently transfers to the RR in order to activate it. Figure 1: Model of the ThkA/TrrA TCS complex. 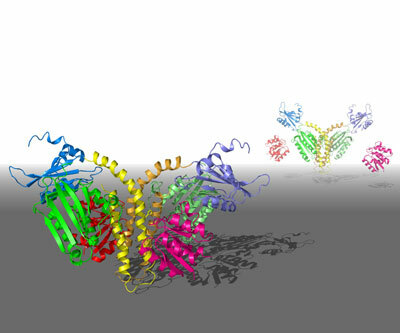 The structure in the foreground may represent the ‘off’ state for this system, where the catalytic domain is physically blocked from interaction with the receptor phosphorylation site. In the background is a proposed structure of the system in its ‘on’ configuration. Many mysteries remain about TCS signaling mechanisms, partly because the proteins involved are complicated and contain floppy, mobile regions that make structural analysis arduous. Shiro and his colleagues recently achieved a breakthrough on this front, however, by assembling a high-resolution reconstruction of the ThkA/TrrA TCS complex from Thermotoga maritima ("Structure of PAS-Linked Histidine Kinase and the Response Regulator Complex"). This bacterium is normally found within geothermal vents, and its proteins exhibit greatly enhanced stability at working temperatures, making structural analysis more feasible. The HK component, ThkA, assembles in pairs through interactions at a ‘dimerization domain’, which also contains the histidine amino acid that receives—and eventually transfers—the phosphate group. Accordingly, Shiro’s team found that the TrrA ‘phosphoacceptor’ aligns closely with this residue, with its orientation governed primarily by three points of interaction between the two proteins. However, they also noted that ThkA’s sensor domain appears to interact with the catalytic domain, blocking access to the phosphate-receiving histidine and thereby preventing activation. Since ThkA/TrrA is similar to another bacterial signaling TCS, FixL/FixJ, which undergoes physical rearrangements in the presence of oxygen, they hypothesize that this blocked configuration might represent the ‘off state’ of a switch that enables selective activation (Fig. 1). “The mode of interaction between the sensor and catalytic domains of HK reveals the signal-transduction pathway at an atomic level,” says Shiro.